When am I going to finally go to Thailand and eat their delicious food? It is one of my favorite cuisines. Suffice it to say I am definitely not going any time soon since I am in full book mode right now! I don’t think I’ve mentioned in the last 5 minutes that my book is coming out on June 13th. Or maybe I have. Super excited! But because I am scattered in a hundred, no a million, different directions right now, you can expect all future blogposts to be a little shorter than usual. This recipe is not in the book even though it is a favorite. I love Thai flavors — salty, sweet, pungent, sometimes a little spicy, but always light and fresh. 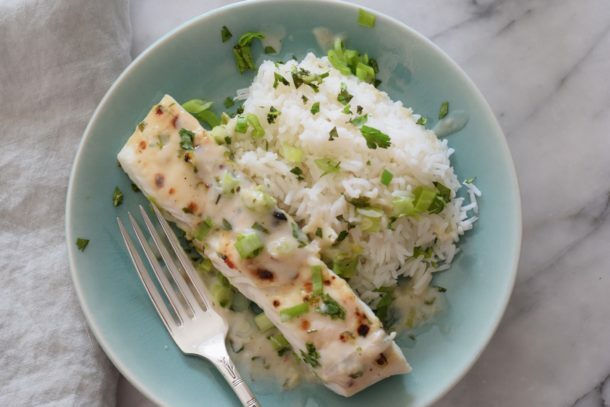 And because I’ve never been to Thailand, I really have no idea if you can expect to eat fish with this unbelievably tasty coconut-ginger sauce. The sauce is the best part. It is so good, I am always mad that I didn’t double it to cover rice and veggies. My protein of choice is legumes or seafood. I don’t know what I would do if my family didn’t enjoy fish. 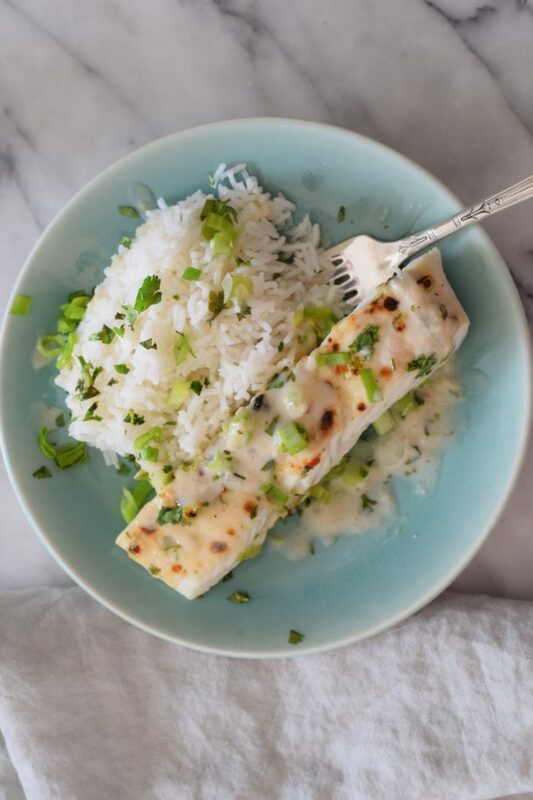 They especially like white fish like halibut, but this sauce will go with anything. It seems like a lot of ingredients, but there’s very little prep involved. If you want to make some of this ahead, I would make the sauce, but don’t reduce it too much because it will thicken as it sits. Then all you have to do is broil the fish and you’re done. Great for a weeknight or for entertaining. 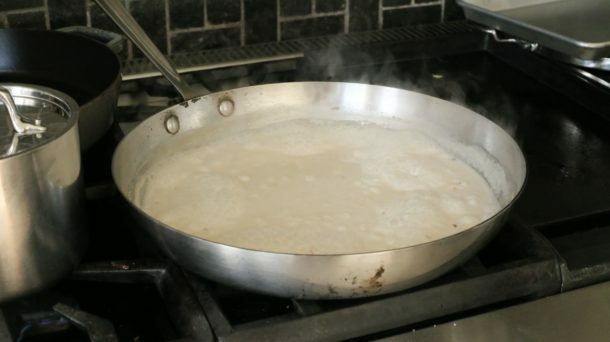 In a large skillet, combine coconut milk, stock, lime juice, ginger, garlic, fish sauce and chili peppers. Bring to a boil over high heat and cook until sauce has thickened slightly and equals about 1 cup to 1 ¼ cup, about 10 minutes. If you use a smaller skillet, it will take longer; a larger skillet, less time. Stir in half the cilantro and half the green onions. 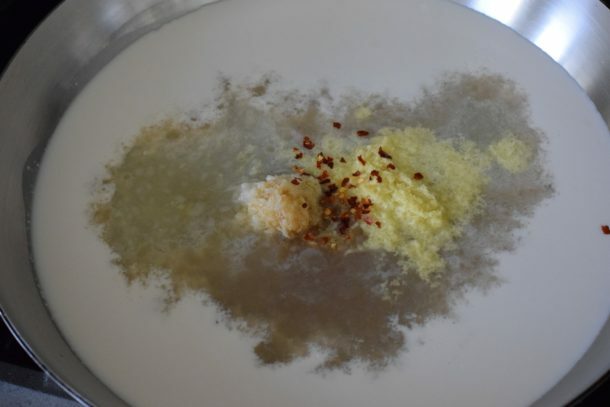 Season with sea salt and pepper. Position an oven rack on the second level from the top. Preheat broiler to medium or medium-high. Brush each piece of fish all over with 1 Tablespoon of sauce and season with salt and pepper to taste. Cover sauce to keep warm. 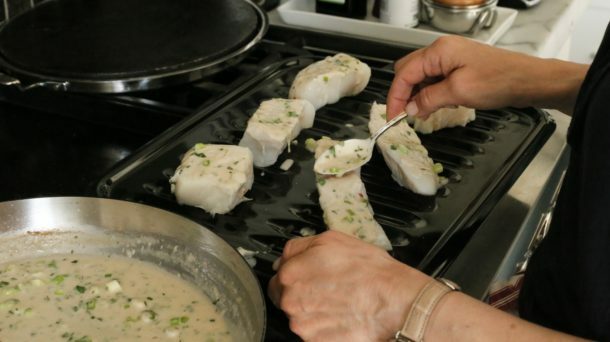 Broil fish until it starts to flake and is opaque in center, about 3-5 minutes on each side, depending on thickness of the fish. Divide fish and sauce among 6 plates. Sprinkle with remaining cilantro and green onions. Serve. I buy fish stock in the freezer section of Whole Foods. Some markets make it in-house and you might find it frozen in the seafood department or with other frozen stocks in the freezer section. Have tried to print three times. Picture prints, no recipe. Any suggestions? Try using the print button just above the recipe. It sits to the left of the 5 stars and to the right of the recipe title. You can’t print from your browser. Let me know if that works for you. Thanks for the very nice recipe. I did sub soy sauce for fish sauce. Because I was using unsweetened coconut milk, I added a couple tbs of brown sugar. I also added about 1.5 tsp turmeric for richer color and about a tsp of dried coriander for its flavor. I also used shrimp instead of fish and, because I was using veggie stock instead of fish stock, I cooked the shrimp shells in the stock and then strained it. Also before adding all liquids to the wok in which I prepared the sauce, I stir fried carrots and bell pepper, and then added some peas at the very end, with the shrimp, after the sauce had thickened. Served over white rice, and the family loved it. Thanks again! Thank you for the generous comment! I love all these suggestions, and kudos to you for making your own shrimp stock. I don’t know why I haven’t tried turmeric here. I definitely will though, thanks! Is there a substitute for using fish stock. I know it sounds crazy since I am cooking fish, but it is not a favorite! Sure! Just use chicken stock! Prints fine on my computer. Thank you for sharing! PLEASE let us print these recipes – my printer shows a blank page when I try.